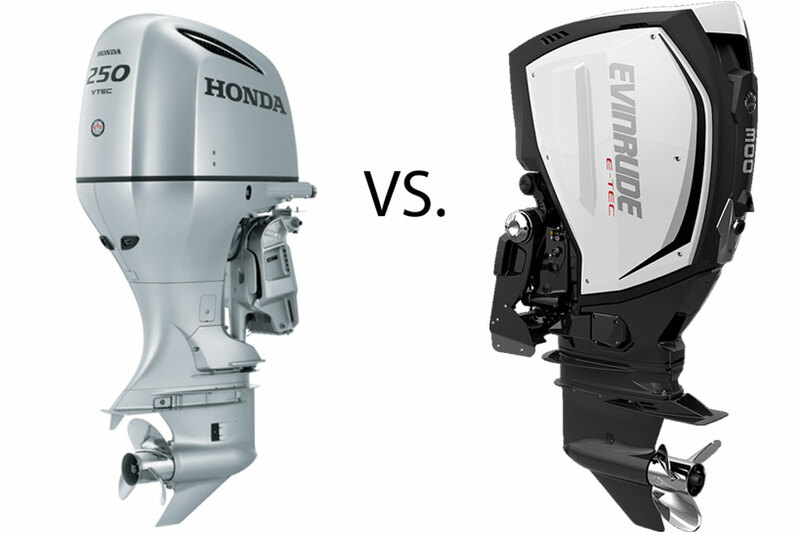 North and south of the border, a couple of new fast V-bottoms are lighting up the water. 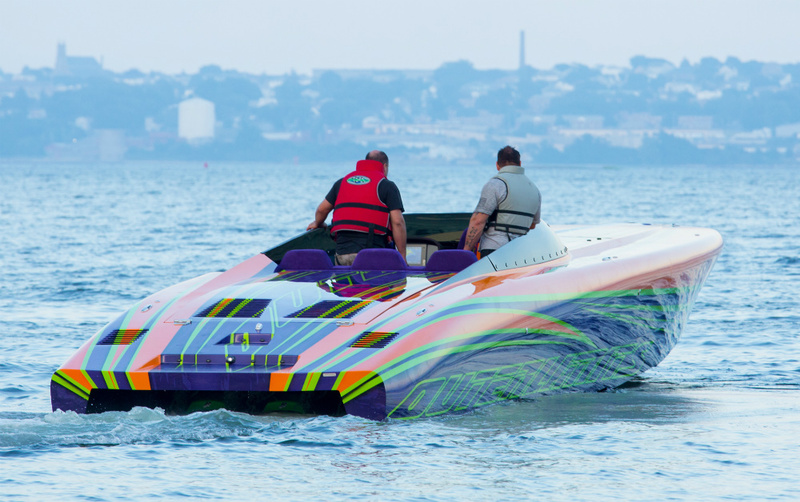 Speculation on the future of Outerlimits Powerboats in Bristol, R.I., ran rampant after Mike Fiore, the owner and founder of the company, died following injuries he sustained during the Lake of the Ozarks Shootout almost two years ago this month. But under its new ownership, the company restructured and emerged, step by step, to reclaim its place as the builder of the world’s fastest custom high-performance V-bottoms. Charismatic, fiery and brilliant, Fiore will forever be missed by his customers and employees but the company he started appears to be on solid footing. This spectacular SV 50 went to a longtime Outerlimits client in Canada. 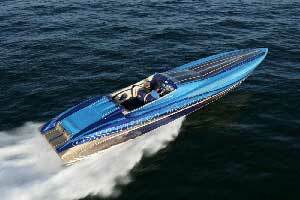 Photos courtesy Halsey Fulton/Outerlimits Powerboats. 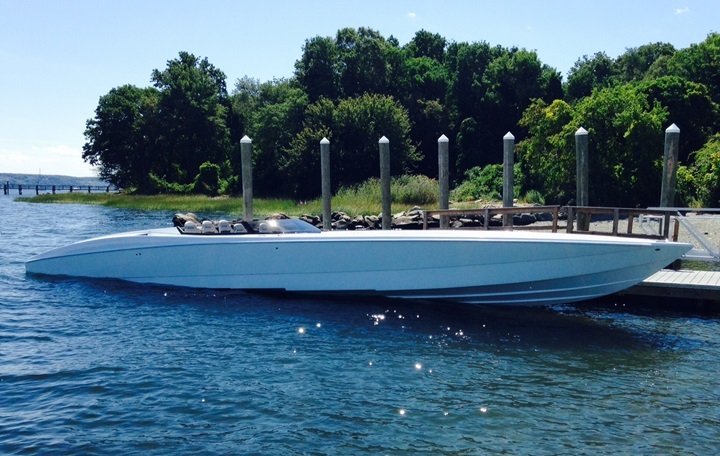 Recently, Outerlimits delivered two spectacular V-bottoms to a couple of lucky owners. Both are in the company’s line of sit-down cockpit V-bottoms, dubbed the SV series. 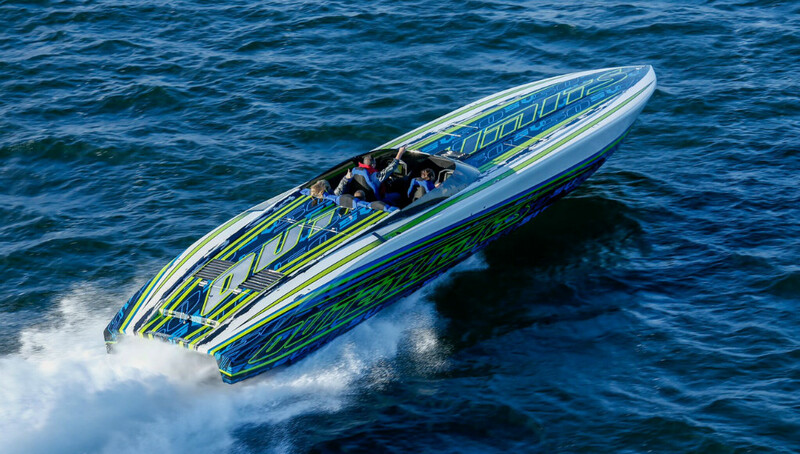 Powered by custom color-matched Mercury Racing 1350 engines with matching M8 drives, the first boat—an SV 50 model—went to a customer in Ontario, Canada. 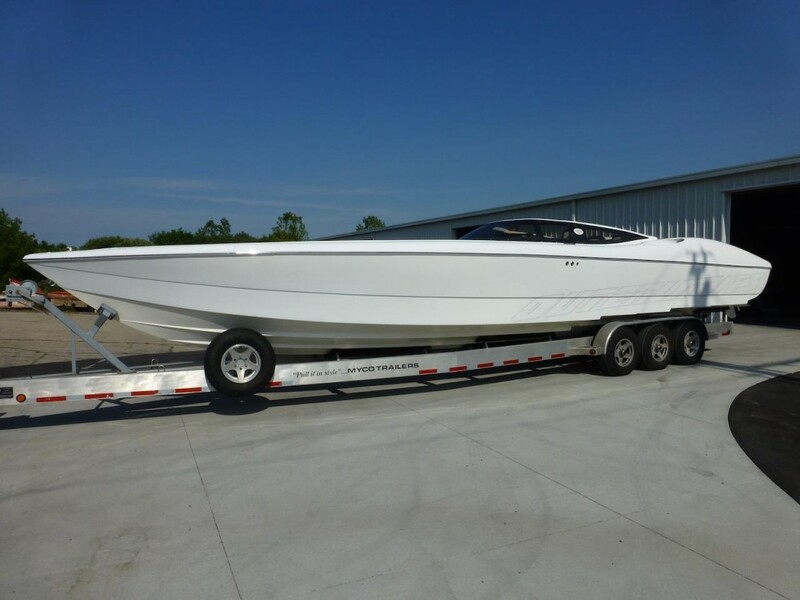 A longtime Outerlimits customer who has owned an SL 52, a 42 Legacy, and a 51 Sport Yacht, the Canadian buyer, who prefers to remain nameless, ordered the boat in September 2015. Ace paint man Stephen Miles handled the design and execution of V-bottom’s graphics. Lee Aerospace created its custom windshield. The customer supplied the components for the stereo system. 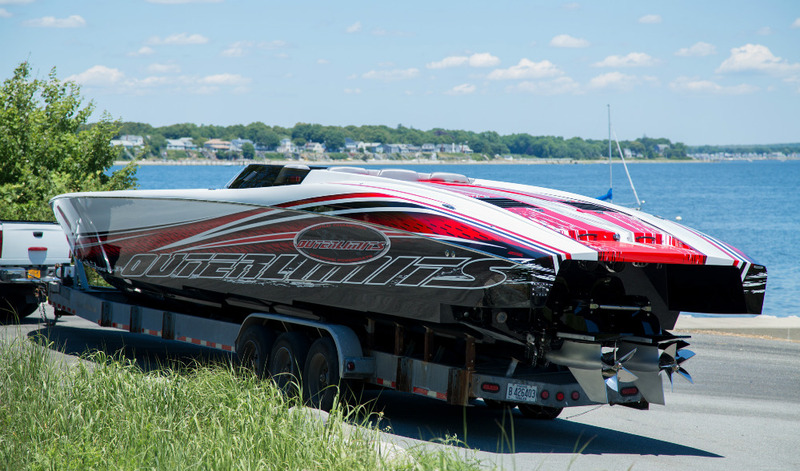 Outerlimits also completed an SV 43 for Wisconsin-based client Vinnie Diorio, who has previously owned a 41-foot Outerlimits and two of the builder’s 39-footers. 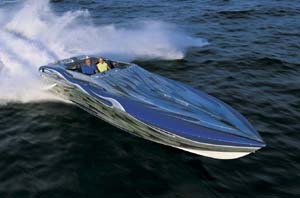 Like the SV 50 delivered to the Canadian client, the 43-footer is powered by twin 1,350 HP engines from Mercury Racing. In a quick test in Bristol before Diorio began hauling his new boat 1,200-plus miles home, the boat reportedly reached 140 MPH (The 50-footer reportedly achieved a similar speed in its first sea trial). “We didn’t have much time, and conditions weren’t great—there were no long, calm stretches of water—but we ran it up to a quick 140 MPH with four guys and a full load of fuel in a short test yesterday,” said Dan Kleitz. “It has a lot more left it in it. But we had to get Vinnie on the road and headed home. Highlights of Diorio’s 43-footer include a purple Alcantara interior, a Wave and Wheels Focal stereo system, dual Garmin GPS units in the dash and a Stephen Miles Design custom paint job. Vinnie Diorio, another devoted Outerlimits customer, took delivery of this stunning SV 43. “Stephen is, by far, the best guy painting boats right now—hands down,” said Diorio. “The quality, the pureness of the paint—it’s amazing. I cannot believe how perfect the paint job is." 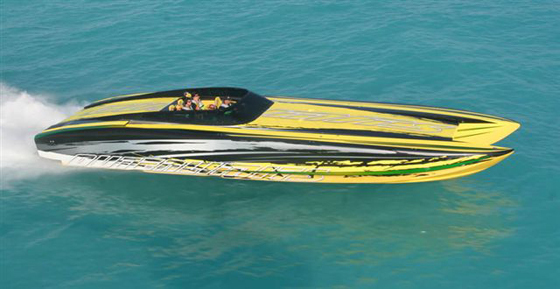 Diorio plans to run the boat in the upcoming 1,000 Islands Poker Run, the Outerlimits Owners Rendezvous during the Lake of the Ozarks Shootout, and in the Grand Island Poker Run. And he’s eager to strut his new 43-footer’s stuff.